Is More dangerous than outdoor dust? In office buildings, cooling ventilation systems are frequent sources of biological substances that are inhaled, leading to breathing problems. Dust aggravates breathing problems, causes burning eyes and itching skin, and makes allergy problems worse. Health agencies, and scientific researchers claim that airborne dust may be one of the worst causes of health related problem. This is mainly because airborne dust has bacteria, pollen, skin flakes, decaying organic matter, fungi, hair, dust mites, viruses, textile fiber, residue from chemicals, and many other contaminants which promote poor indoor air quality are a major cause of days lost from work. It is our dedication to build business through working smarter with uncompromising standards for integrity. Our commercial air duct cleaning in South Florida is targeted towards large businesses, industries and public buildings, which often deal with larger air duct systems and a different indoor environment in comparison to residential units. Pure Air Twins, use state-of-the-art, industrial grade vacuums that remove deposits of dust and dirt through a powerful negative pressure system. All of our commercial air duct cleaning technicians are experienced and professionally trained in all aspects of our offered services. 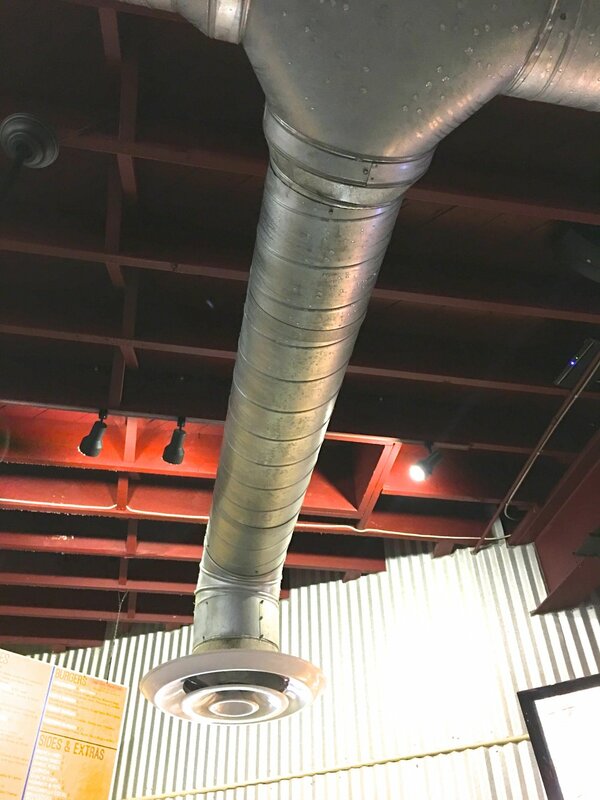 Commercial air duct cleaning is extremely important because public places often have a large amount of foot traffic and air filters are prone to becoming contaminated at a more rapid rate. Aside from providing cleaner air for people to breathe, commercial air duct cleaning can also reduce energy usage by improving the efficiency of air flow through vents and filters. Total HVAC and duct cleaning involves the components of the forced air systems, which include the air returns, the supply air ducts and registers, the diffusers, grilles, heating and cooling coils, the fan motors and housing, the air handling units and drip pans (where the moisture condenses and collects). It is vital that the service contractor clean all components, one dirty component could potentially contaminate the air system all over again. After the HVAC system has been properly cleaned, our professionals sanitized or de-contaminated with safe and eco-friendly products to add extended protection against microbe contamination. According to the EPA, a build-up of only 0.42″ of dirt on a cooling coil can decrease efficiency by 21%. Airborne contaminants are pulled into the ducts every time the cooling system runs. Over time, these contaminants build up inside the ductwork, creating an ideal breeding ground for mold, bacteria, fungi and other microbes. Particles drawn into the air ducts also pass through fiberglass filters and infiltrate into HVAC equipment, undermining the performance and energy efficiency of these systems. This can lead to higher repair and maintenance costs, and shorter service life in the long run. Offices have contaminated air that is circulated through the central air system, even frequent filter change cannot stop those contamination, a disposable air filter catches less than 15% of dust and dirt that allows more than 85% of the polluting to insert in your system and air ducts. Contamination builds up over time in your air system, this build up will shorten its operating life, reduce the efficiency of your cooling, and continued to circulate the contaminants throughout your home or office. Billions of dollars are spent each year to treat the symptoms of contaminated air. Today, our work places are airtight and energy efficient. This means that more pollutants and contaminates are trapped inside, lowering the quality of air we breathe. Research indicates that people spend approximately 90% of their time indoors. So, the risks to human health may be greater due to exposure to air pollution indoors than outdoors. Further, those people who may be most susceptible to the adverse effects of indoor air pollution are those who tend to spend the greatest amount of time indoors. Dirty air duct systems are a major source of indoor air pollution. However, a newly cleaned system will provide you, your employees and customers with a much cleaner, healthier, and safer environment. The clean system will also run more efficiently than a dirty one, saving you money. Send us an inquiry and we will tailor our services to your needs.